It’s Panto Time! Oh, no it isn’t. Oh, yes it is! The roots of modern pantomime lie in ancient Roman mime and draw heavily on medieval theatre, the tradition of Italian Commedia Dell’Arte and the British Music Hall. The recognisable structure of the modern pantomime is built around a strong story line in which good battles against and overcomes evil. In the theatre, the pantomime villain traditionally enters from stage left, known as ‘the dark side’, and the hero enters from stage right. This echoes morality plays of the middle ages in which the entrance to ‘heaven’ was stage right, and the entrance to ‘hell’ was stage left. In the early-18th century, John Rich, best-known for his staging of John Gay’s ‘The Beggar’s Opera’, coined the term ‘pantomime’, when he introduced an entertainment at the Lincoln’s Inn Fields Theatre in London. It was a bawdy hybrid of dance, music, spectacle and Commedia Dell’Arte and featured the familiar figure of Harlequin at its centre. This new genre of accessible entertainment was immediately popular. It led to the esteemed actor and theatre manager, David Garrick, staging his own ‘pantomime’ at London’s Drury Lane Theatre. By the 1770s, the first recognisable pantomime by modern standards, ‘Jack the Giant Killer’, was being performed at the Theatre Royal in Drury Lane. Others followed: ‘Robinson Crusoe’ (1781), ‘Aladdin and his Wonderful Lamp’ (1788) and ‘Cinderella’ (1804). Joseph Grimaldi set the standard for the pantomime clown. He first appeared in 1800. 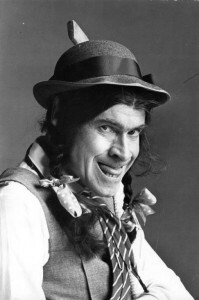 He developed the tradition of gender cross-dressing in pantomime, creating the characters of Queen Rondabellyana in ‘Harlequin and the Red Dwarf’ and Dame Cecily Suet in ‘Harlequin Whittington’. 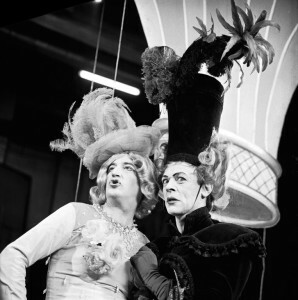 Men dressing as women harked back to earlier days of the theatre when the profession was considered unfit for women and female roles were played by men. 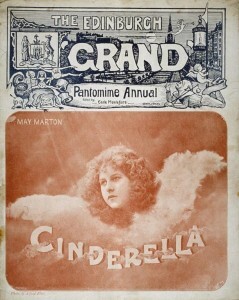 Later influences from the Victorian Music Hall firmly established the role of the Pantomime Dame. The most famous of these was Dan Leno, one of the most popular comedians of the late 19th and early 20th centuries. 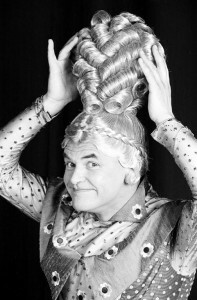 He played ‘Mother Goose’ at the Theatre Royal, Drury Lane in 1902, bringing ‘stage business’ and comedy songs to the role. 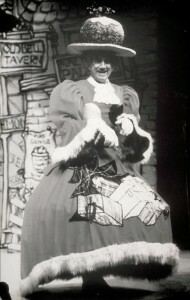 Pantomimes also introduced the principal boy, a role usually played by a girl dressed as a boy. By the 1950s, the role began to be taken up by popular male stars of the day, such as Cliff Richard and Marty Wilde. Today the trend has moved back to the role being played by women. From the 19th century and through into the 20th century, pantomime was produced and promoted as a popular artform by a series of theatre impresarios. Augustus Harris was considered the ‘Father of Modern Pantomime’. He introduced popular music hall stars into his productions at London’s Drury Lane Theatre in the 1870s. These were lavish affairs and went on to tour around the country. In the 1930s and 1940s, Francis Laidler became the ‘King of Pantomimes’. He produced shows at the Alhambra Theatre in Bradford, which also went on to tour nationally. In the 1950s and 1960s, Derek Salberg was famed for his productions which ran at the Alexandra Theatre in Birmingham. Today, many pantomimes across the country are produced by a company called Qdos. The modern pantomime continues to adapt to survive. The genre remains peculiarly British. Some shows have run in countries such as Canada and Australia, but with limited success. Today’s productions endeavour to combine tradition with novelty, drawing on modern trends and topicality to engage audiences. Pantomime remains a thriving business in theatres across the country, attracting popular stars for runs of six to eight weeks and providing healthy box office revenues.